When you set the key size to 4096, it gives you a 2048 instead. Is this a bug or what might be the problem? 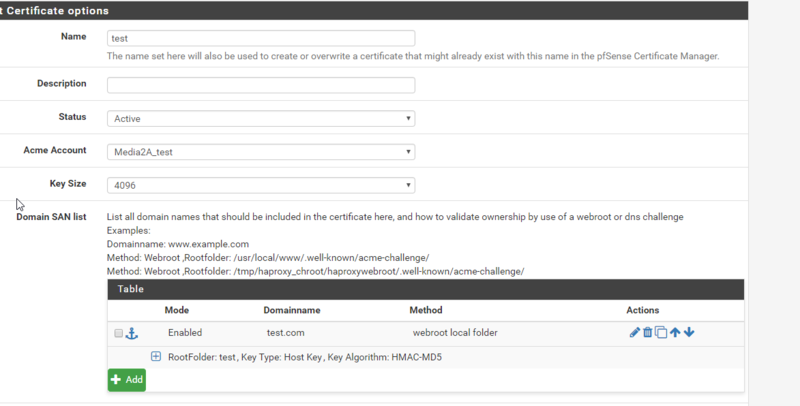 Could it be you changed the keysize after already creating the same certificate before? I just tried to create a (new) cert with 4096 keysize inside acme package and that seemed to work fine. If there is a problem its probably on the acme side. haproxy wont change the keysize on a cert, also you can double check in System\CertificateManager and download the cert there. It should also be 2048 in your current case. So haproxy using that cert wont have any other option than to present what was available from the CertificateManager.. I downloaded the the certificate in the cert manager and it says 2048 aswell. Maybe I should try and reinstall it and clean up the old files in /tmp? Hostkey and keyalgo would be coming from 'old' settings that are now hidden in the edit view but still present in the configuration.. They are harmless, to get rid of them just add a new SAN list item, instead of cloning the existing one? Then manually take over the required information and remove the previous one. Reinstalling the package wont help, it doesn't (and shouldn't) clear all configuration settings when removed..